Here is a summary of all our prices for scanning and other services: Scanning Slides, Scanning Negatives, Scanning Photographs, Restoring Photographs, and Retouching (editing/"photo-shopping") Photographs. Compare and see how much you can save! Note: We accept materials from all locations: USA, Canada, and beyond. Notes: Prices above are totals; example: 100, 35mm images including Premier Processing = $50.00. When you elect Premier Processing, you get both sets of images: Image Only, & Premier. * We are able to Scan 127 Superslides without cropping the images. (Most places can't do that!). The MP resolution is somewhat lower, however, because of the square format of the images. ** Image Rotation available for $0.03/slide. ** Add $0.05/image for TIFF/RAW files. *** Includes Image Rotation; Add $0.10/image for TIFF/RAW files. † "Stereo Pairs" includes conversion & processing of both Left & Right Images separately. For an additional charge of $2.00/pair, we can produce a third, combined image with both the left and right portions of the image side-by-side, at a scale that, when printed, allows viewing the 3-D image without a viewer. For more information, send a request to: support@digitalconversions.biz.This charge is included in the pricing (below) for Stereo Pair Prints ($4.50 each). †† "Stereo/Single": This service captures just one of the two images in a stereo slide, turning it into the equivalent of a standard slide. ** For Photo Albums, scans of each individual photo in addition to the full page scan are available for $0.15 less than the photo prices listed above (same dpi). Premier Service for album pages is $0.40/page. File Data Storage: The prices quoted above are for the conversion of your images into digital files. The cost of the media to hold your data is in addition to the scanning charges. The best media for your files will depend on the total size of your image library, and your personal preference. We offer several options for loading your data: standard DVDs (4.7GB capacity, $5.00 ea. ), Blu-Ray DVDs, which range from 4.7GB up to 25GB, and cost between $6.00 - $9.00/disc, and flash drives, which start at $12.00 for a 16GB drive. Prices for larger drives will be quoted when your job is completed and we know what size drive would be needed. Flash drives are like lobster - prices vary greatly over time, and we base our charges on the price that is currently available. Of course, flash drives have the advantage that they can be repurposed once you have downloaded your files - or, you can simply keep them loaded with your data as an additional backup, and a convenient way to have your files with you. If you have a preference for a particular file storage medium, you can indicate that on yourrequest/order form. If your initial choice is not practical due to the size of your data set, we will contact you to discuss alternatives. Index Image Prints: To make it easier for you to organize and manage your digital photo archives, we distribute your pictures into a series of separate Folios (sub-directories), typically containing about 50-60 images each. Of course, you may specify another system for organizing your pictures if you wish. * The approximate number of images in a job at the maximum number of pages for that range. ** The "Cap" is the maximum charge for pages in that quantity range. We do this to avoid a situation where a Customer would be charged more, for example, for 48 pages (48 x $1.60 = $80.00) than a case where the total number of pages was 51 (51 x $1.60 = $76.50). The prices in the chart are for prints on plain 20lb bond paper. We recommend using plain bond paper, as photographic quality is not really an issue for this purpose. For printing on photo paper, add $1.00/page. The Index prints you receive will be contained in an appropriate binder to keep them together. Once you have your photos in digital form, you may still want to have some of them in the form of physical photographic prints. For example, you may have a special photo that you want to keep on your desk. Or, perhaps, the pictures you have had digitized were in the form of slides, or negatives, and you want to have some of them printed. What ever the reason, we can provide a full photo printing service. For full details, follow that link. * "Stereo Pair" prints are printed at a size that allows viewing them in 3-D without the use of a viewer. If you are not familiar with this technique, send a request for information to support@digitalconversions.biz. This price includes the Premier Service and Image Pairing charges described above. ** Volume pricing is based on the total number of prints in a job. We can turn all your images into a Video Slide Show and load it onto a DVD that can be played on your TV: $0.04/image. Note that if these companies do any post-processing, they use "Digital Ice" to "automatically" remove dust and dirt from the images. Automated solutions are a comporomise at best. We hand-process all work for our Premier Service. The same is true for all adjustments made to images for color and exposure improvement. For a comparison of our work with what large commercial companies produce, see ourCostco comparison. Most restorations range in cost between $20.00 - $50.00. Restoration is an art form, and results cannot be quaranteed, but your satisfaction is. Once we have restored your photo(s), if you do not wish to purchase the resulting image(s), then you owe us nothing, and we will simply return your original material. When we have completed the processing of your images, we will send you an invoice through PayPal. You can pay this invoice with a credit or debit card, without having a PayPal account of your own. Once your payment has been received by PayPal, we will ship your materials and data files to you, or if you are local, make arrangements with you for a delivery appointment. As a way of introducing you to our Service, we invite you to try our Slide, Negative or Photograph Scanning Service for FREE. We will scan up to six slides, eight negatives, or 1 - 4 photographs (depending on size) absolutely free of charge (See the Free-Scans Request Form). The resulting jpeg images will be sent to you via Dripbox, and your originals will be sent back to you in a return envelope that you will provide to us. To get your free scans, just fill out the Free-Scans Request Form and submit it online. We will reply with an email providing you with instructions on how to send us your negatives or photos, along with a mailing label that you will need to use for your envelope. Please do not send us any materials without receiving this instructive email. Large orders will be sectioned into file sub-directories of about 50-100 images, and all orders will include an Index image that contains thumbnail images of each picture, together with its file name. That way you can quickly search for a particular image, or easily review all of the images in the file. Of course, we will organize the images into specific categories of your choosing if you provide the necessary instructions. Please note that if you have both a negative and a photographic print of that negative, it is always best to send us the negative to be digitized. That insures that you will have all off the detail of the original picture in your digital file, without the losses that can occur when the negative image is processed to make a print. 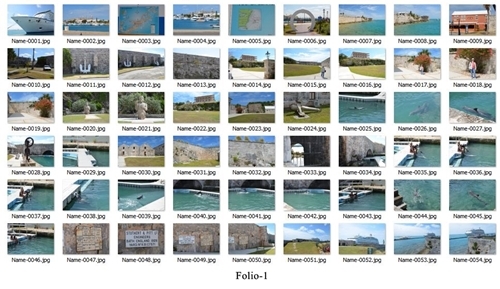 Many automatic photo processors apply automatic "corrections" to prints that are actually distortions of the original image. By scanning the negative, you will recover any detail that was lost due to a poor printing process. Remember - Digital Conversions LLC provides the lowest cost high-resolution photo scanning services.